You are here: Home / Blog / Who is allowed on the Al Aqsa Mosque Compound? Who is allowed on the Al Aqsa Mosque Compound? It is 8 am on the Israeli Independence day, which this year was on the 6th of May. There is tension in the air. A group Jewish worshippers walk around on the Al Aqsa Mosque Compound escorted by Israeli police. The few Muslims that were allowed in to the area this morning watch with worry in their eyes as the provocation enfolds. After the Six day war in 1967, when Israeli military annexed East Jerusalem, a deal was made on the protection of the holy sites. The Israeli Knesset passed the Preservation of the Holy Places Law, guaranteeing different religious groups access to their holy sites. 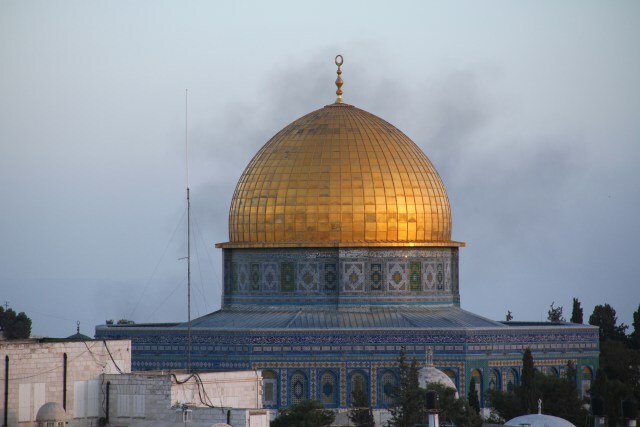 A deal was also made with the Islamic Waqf, where Israel agreed to leave the administration of the holy site of the Al Aqsa Mosque Compound, which includes the Dome of the Rock, in the hands of the Islamic Waqf, while the Israeli police would guarantee and secure access to it. The great majority of religious Jews respect this decision. Futhermore, the Chief Rabbinate of Israel even declared in 1967 that it is forbidden for Jews to walk on the Temple Mount, which many believe is the same location as the Al Aqsa Mosque Compound, due to its pronounced sanctity. However, for some years now, Jewish eschatological groups have tried to come up on the Al Aqsa Mosque Compound, which they believe is the location of the Temple Mount, and worship. This is naturally seen as a provocation by both religious and secular Muslims, and often leads to clashes. Furthermore, in recent years, the Israeli Authorities have been put under growing pressure from Jewish extremists, who maintain that Israel should take control of the Al Aqsa Mosque Compound, because it is the Temple Mount. The Al Aqsa Mosque Compound is no doubt one of the most contested religious sites in the world, and remains a key focal point of the Palestinian–Israeli conflict. Many experts thus say that moving control over it to Israel would threaten not only the peace process between Israel and Palestine, but also peace with Israel’s neighboring countries. It is thus no surprise, that on Israeli Independence Day, the Israeli police expected clashes when Muslims under 50 years of age had to stand outside of Al Aqsa Mosque Compound queuing, while tourists and a group of provocative Jewish extremists had free access to the compound. In the afternoon, a group from the Third Temple Movement demonstrate at the Al Aqsa Mosque Compound. A group wishes to pray up on the holy site. The police monitoring the demonstration are noticeably bothered by the activity, while the demonstrators show little respect for the police’s authority. When the protesters move towards the Chain Gate leading to the Al Aqsa Mosque Compound, they forcefully push through the Israeli police and their roadblocks. Some of the protesters are arrested, while others are forced towards the upper entrance to the Western Wall plaza. The protestors are jammed through the metal detectors, while trying to fight the police. As they are pushed out, other Jewish worshippers at the Western Wall halt what ever they are doing, and turn to see the spectacle. Many start filming with their phones. Neither the demonstration, nor protesters seem to receive common support, rather they soon face counter arguments and aversion. Clear discontent towards them lingers in the air. However, there is also a different reasoning behind the rally, which could be found on a blog of the group arranging the demonstration. They write that the goal of the Independence Day activities was to transfer the authority over the Temple Mount into Jewish control, while the Third Temple Movement’s final aim is to build a new temple. Still, the antipathy of other Jewish worshippers at the Western Wall, and their negative view of the Third Temple Movement, reveal something positive. It shows that people are getting tired of how smaller extremist groups constantly threaten the peace process, eventually trying to cause tensions and divisions between Israelis and Palestinians, but also within Israeli society. Working towards a just peace would, to them too, mean guaranteeing that Muslims are allowed to access their holy sites in the same way as Jews have access to the Western Wall, without routine restrictions and limitations.